Despite the fact that I am not a skincare expert and my face tends to hate All The Things, I decided that I'd shift my focus to skincare in 2018. This doesn't mean I'm not going to buy makeup--lipstick still exists and I am weak--but it does mean I'll be trying to get my base in order so that makeup application is all the easier. And if I'm going to invest time and money in to something, I also want to write about it for my blog, even if my reviews are not especially technical or wildly helpful. Hence, I'm starting a mini-review series called Pray For My Face. Why that title? Well, if you've been here for a while, you know that testing a new product makes me a little leery. My skin can be very reactive, and many of the ingredients that are supposed to be beneficial for dry skin (shea butter, caprylic triglyceride, etc.) break me out. So when I post a picture of the next contender on Instagram, I usually add the hyperbolic caption "pray for my face." I use that caption so often, in fact, that I didn't think there was any other appropriate title for this series. I'm happy to say that the first post in this series features a slew of winners and a decent variety of products. I can't guarantee that future posts will always be this happy, and in fact, I'm sure there will be some wailing and gnashing of teeth when a moisturizer or a mask inevitably turns me beet red. But for today, ah, there is only joy. With some criticism. I may be more exfoliated and better moisturized, but I'm still me. One of the things that always drives me nuts is how much whiter my neck and chest are than my face. There are plenty of days when I want to do my brows and dab on some blush, but skip the foundation, and the stark color difference in my skintone can really ruin the effect. I've actually gotten comments on Instagram about how I need to learn how to match my foundation...when I'm not wearing any foundation. There are plenty of self-tanning lotions on the market, many of them cheap and effective, but I was told that this Clarins one gave the most natural color and wouldn't stain my pillowcase. Clarins recommends applying a small amount of this lotion to clean skin with a cotton pad, so I spread a little on to a Shiseido cotton, then wiped it down my jaw and neck. After two nights of this, I got nice base color somewhere between my NC5 chest and NC15 face, and I began to use it every other night. There was no streaking and the overall effect was really natural. There is a bit of a self tanner smell, which is unpleasant, but it usually fades within the hour. Unfortunately, I don't think this product is quite right for me. The photo above is very forgiving, but in natural light, the color this self-tanner produces is...well, it's off. 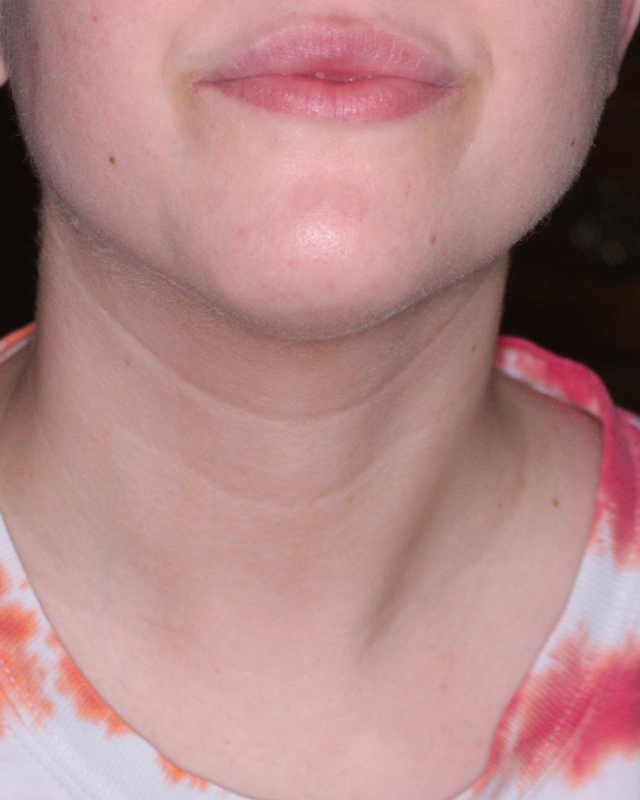 It's not that my neck ends up looking orange; rather, it looks a bit bright and peachy compared to my more muted face. I'll be returning the Clarins Liquid Bronze, but if you're light skinned and looking for a natural, lightweight face and neck tanner, this one has a truly beautiful formula. I don't have clinical acne, but I usually have a pimple or two on my face, and I like to treat them as thoroughly as I can. The problem is that most spot treatments are incredibly stripping, which can actually make you break out more and is not optimal for my bone dry face. Enter the Neutrogena Light Therapy Acne Spot Treatment, a pen that promises to speed up the healing process with blue and red light therapy. 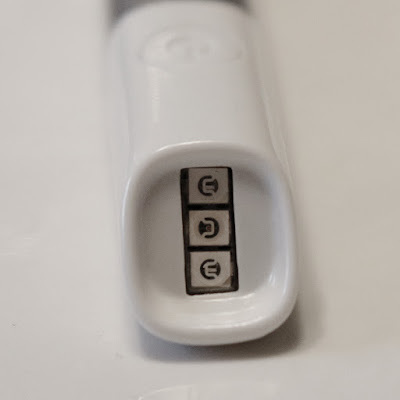 Using this pen seems easy: you just place it on your spot, press the button until the lights turn on, and hold the pen in place for 2 minutes. (It will beep and shut off automatically when it's done.) I say seems because it can actually be a bit uncomfortable to hold your arm up for 2 minutes at a go, and there isn't a large surface area on this pen--it's easy for it to slip a little on your face without you realizing and miss the blemish entirely. Also, the pen is powered by a AAA battery, and each battery seemed to give me just a month's worth of use. Thankfully, rechargeable batteries seem to work just fine. That said, I do like this product. If I rest my elbow on my desk and watch YouTube videos while the pen runs, I can usually keep it in place just fine. Neutrogena recommends using this on each blemish three times a day, but I think twice a day is just as good. After two good zaps with this pen, I find that my blemishes are reduced and healing faster than usual. Most importantly, this product doesn't burn or sting, and it won't interfere with any of your other skincare. I will note that this doesn't seem to work on cysts. They're most likely too deep under the skin for the light to penetrate. 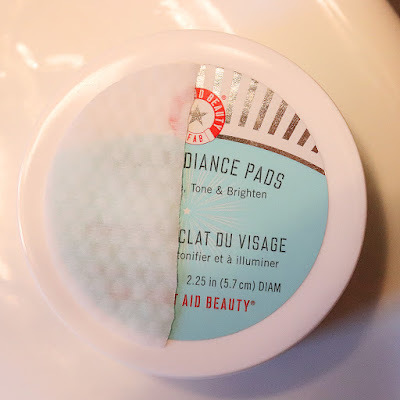 I was having a rough time finding a less-than-5% AHA product that didn't have a scary ingredients list or cost a kidney, so an industry friend offered up a jar of the First Aid Beauty Facial Radiance Pads. I'd heard wonderful things about these pads for months, but the citrus extracts and the cost made me avoid them. "Just patch test them first," my friend said, "and cut the pads in half." "Cut the pads in half? Will there even be enough to do my entire face? I've got a really long face." "No, really," she insisted, "they're big enough. Just cut them in half." She's right: half a pad is definitely enough for my entire face, partially because they're a nice sized pad and partially because they're quite saturated with product. (If you have a larger face or you like to do your neck, you'll still want the full pad.) The actual liquid contains a mixture of glycolic and lactic acid. Paula's Choice says there's a total of 5% AHA, while FAB apparently told this Reddit user they contain "1.760000% of Lactic Acid and 1.400000% of Glycolic Acid," which is hilariously specific. Regardless of the exact number, it's clearly a gentler exfoliant. I will note that the citrus extracts haven't bothered me, but that may not be the case for you. I like to use these right after cleansing and patting my face dry. I run half a pad over my face, avoiding my lips and eyes, and let it sit for about 5 minutes before moisturizing. One of the nicest things about these pads is that they don't leave any sort of residue on the skin and there's no strong scent--that's a welcome change from a lot of stronger AHAs. I use half a pad about twice a week on my dry, dehydrated, reactive skin, and they give me a subtle healthy glow. 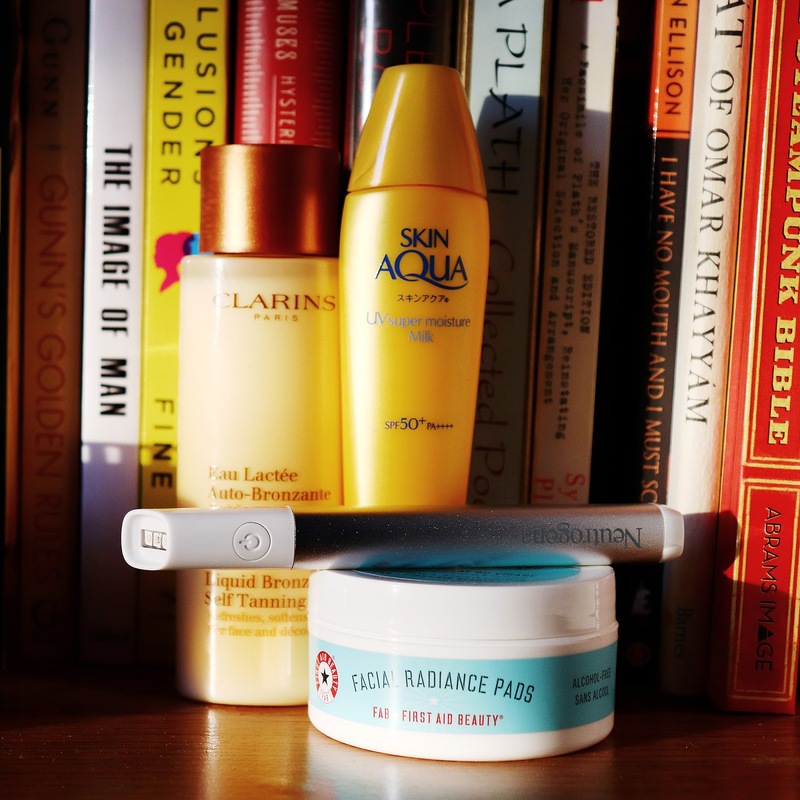 I envy bloggers who show off collections of well-loved face sunscreens. While I've found a number of body sunscreens that I truly love, I haven't been so lucky above the shoulders. Most of the face sunscreens I've tested have broken me out, parched my skin, or gone geisha white on my already pale complexion. The few western sunscreens with viably light formulas were loaded with denatured alcohol, which always wrecks my face in the long run. So I turned to Japan for a face sunscreen I could love. 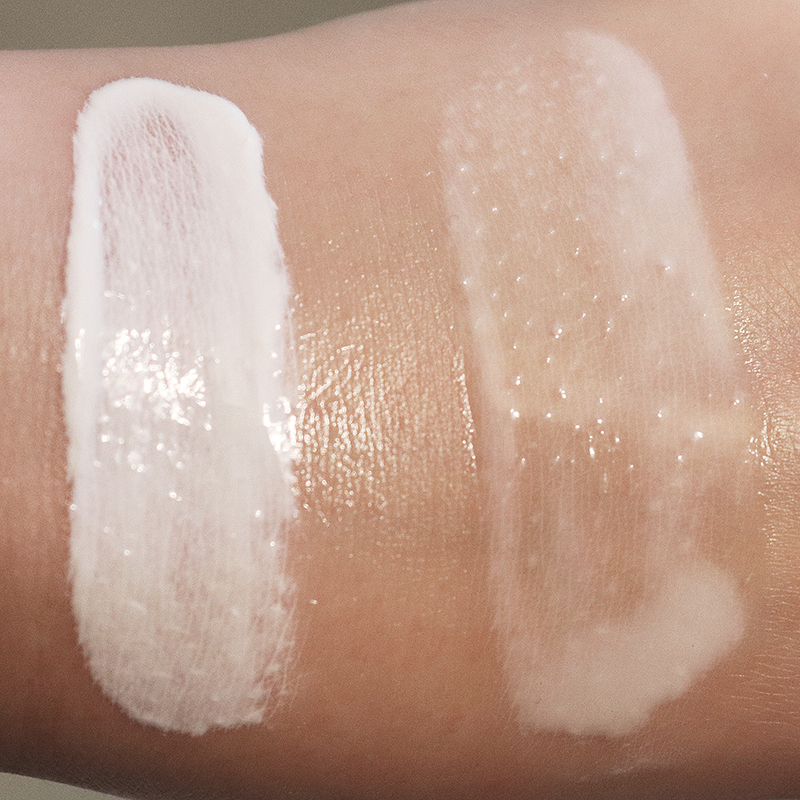 After trying a handful of options, the Rohto Skin Aqua UV Super Moisture Milk emerged as the clear winner. The Skin Aqua Super Moisture Milk is an alcohol-free sunscreen with a thin, liquidy texture; you can see just how thin it is up against Blue Lizard Sensitive in the photo above. It's a translucent white when it first comes out of the bottle, but it rubs in totally clear and feels weightless on my face. This doesn't dry my face out at all, and I can use it all around my eyes without any irritation or watering. (People with normal to slightly dry skin will likely find this lightly moisturizing, while people with oily skin should probably avoid this particular formula and go for a gel texture instead.) It's also a tenacious sunscreen: it kept me from burning during a sweaty trip to the zoo, and I had to use oil to remove it at the end of the day. This sunscreen has been getting rave reviews across the internet, but it's not without its faults. For one, it's more expensive than any other Japanese sunscreen I tried. $11 doesn't sound like much, but the bottle is only one ounce. Also, you'll most likely have to order this directly from Japan, which means a longer wait if you live in western hemisphere. And lastly, this isn't fragrance free. I can't actually smell anything when it's on my face, but if your skin is sensitive to fragrance of any kind, take a pass on this one. Investing more in skincare and less in makeup, as well as learning about ingredients, really saved my skin. I'm oily and acne-prone, and I got fed up with my skin and decided my goal would be to use less and less foundation, and even to not need it anymore. It was an expensive decision, as I live in the UK/ France, and they don't accept returns after you've used a product. But I'm glad I did this. Now I have way less pigmentation from scars, my skin is soft for the first time ever, and a lot of my anxiety has gone. I'm teaching in Uni like you and not worrying about the appearance of my skin when I'm talking to students is a huge relief! I really like the Cosrx pads. They're something like $15 for 70 and the ingredients are great. The pimple clearing ones, right? They're a BHA pad, which is why I don't use them, but if people want an effective and affordable BHA, they could be a great option! The ingredients list is very minimal. Have you tried any of the Elta MD sunscreens? I've been using the clear UV 46 for a couple of years now with absolutely no irritation. It's not super cheap but you can usually find it on Amazon. I didn't care for the texture of any of the ones I felt, and honestly, I think Japanese sunscreens tend to have better textures for a fraction of the price. That's just my personal preference, of course.